The idea for using a loaf pan came to me after making a loaf of nut butter bread, which didn’t rise much and the slices were the same width and length of biscotti. When the sliced biscotti are taken out of the oven, they may be soft but as they cool they will harden. Preheat oven to 325ºF and line a 9 1/2-inch x 5 1/2-inch loaf pan with parchment paper. In a bowl, incorporate the nut flours, baking soda, cinnamon, and currants. In a separate bowl, beat together the egg, honey, coconut oil, and extracts until creamy and fully blended. Stir in the dry ingredients into the wet mixture until all the flour mixture has been used. The batter will be somewhat similar to dough and it will be very stiff and sticky. Spoon all the dough into the loaf pan, making sure to spread evenly to ensure even baking. Bake 35 minutes. Despite the baking soda used, the biscotti will not rise much. Remove biscotti from the oven and cool for about 5 minutes or so. Reduce oven temperature to 275ºF. After it’s cooled enough, remove from the pan and slice crosswise. Lay the slices, cut side up, on a baking sheet lined with parchment paper and bake for 20 minutes. Remove biscotti from oven and cool. As it cools, it will become firmer and develop a pleasant crunch. 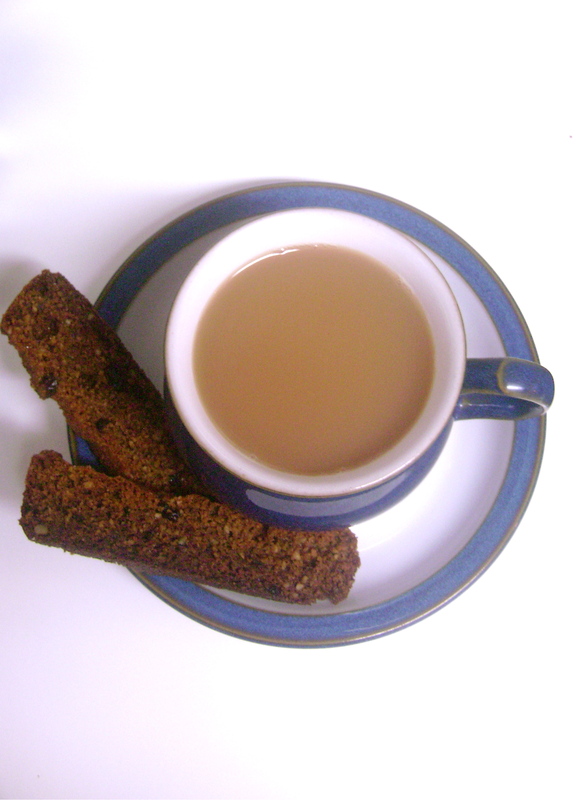 Dunk the biscotti in tea or eat as is. Store in an airtight container. Enjoy! A result of photo editing. Also used as Ambrosia Tea Party’s blavatar. I am liking cooking with coconut oil more and I never saw it in many recipes before some of yours. I had never heard of this diet style either until my friend was diagnosed with Celiacs and was turned onto it. I really want to make these as a surprise. How long do they last while still tasting fresher? Thanks! The biscotti should stay fresh for at least a few days to a week. 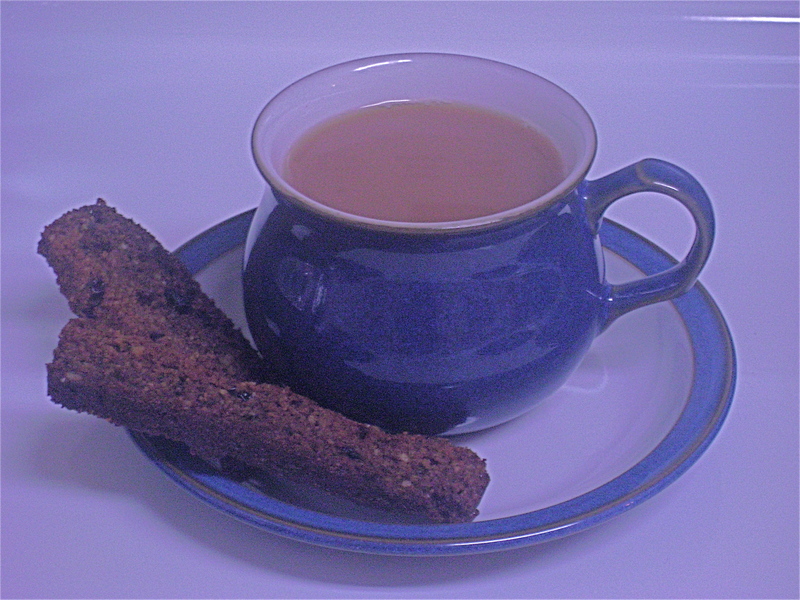 The biscotti can be left out uncovered, though it would probably be best to store them in a container after a few days. Thank you for commenting!